Home / British DDS / DDS / ICC / Malcolm Conlan / Mar Roxas / Otso Diretso / Pres. Rody Duterte / Rep. Gary Alejano / Viral Stories / British DDS Chides Gary Alejano for Saying "You Can Withdraw But You Cannot Hide"
British DDS Chides Gary Alejano for Saying "You Can Withdraw But You Cannot Hide"
London-based DDS Blogger Malcolm Conlan released an Open Letter to senatorial bet Gary Alejano after his controversial statement Pres. Rody Duterte. 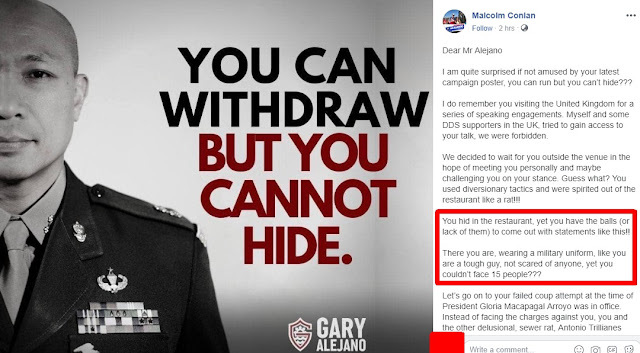 Rep Gary Alejano of the Magdalo Group posted a controversial photo on his Facebook Page with the following caption "You Can Withdraw But You Cannot Hide," which is referring to the decision of the Philippine government to withdraw from the International Criminal Court (ICC). The statement of Alejano did not sit well among the supporters of Press. Rody Duterte on social media especially to a veteran defender and London-based blogger Malcolm Conlan who responded to Alejano's statement with an Open Letter slamming the statement of Alejano on social media. Malcolm Conlan responded to Alejano's statement by reminding the Magdalo Congressman of how he hides from DDS Europe and Conlan when Alejano visited the United Kingdom for a speaking engagement. Although Alejano was wearing his usual military uniform to an impression of his toughness, he still failed to face at least 15 people during his trip to Europe. Malcolm Conlan also reminded Alejano of his failed coup attempt that instead of facing the charges against him and Trillanes, they failed to face justice. Pres. Duterte, on the other hand, is not hiding from anybody, previously, they welcomed a fair, honest, unbiased and independent investigation, however, the ICC is very politically motivated and bias. I am quite surprised if not amused by your latest campaign poster, you can run but you can’t hide??? I do remember you visiting the United Kingdom for a series of speaking engagements. Myself and some DDS supporters in the UK, tried to gain access to your talk, we were forbidden. We decided to wait for you outside the venue in the hope of meeting you personally and maybe challenging you on your stance. Guess what? You used diversionary tactics and were spirited out of the restaurant like a rat!!! You hid in the restaurant, yet you have the balls (or lack of them) to come out with statements like this!! There you are, wearing a military uniform, like you are a tough guy, not scared of anyone, yet you couldn’t face 15 people??? Let’s go on to your failed coup attempt at the time of President Gloria Macapagal Arroyo was in office. Instead of facing the charges against you, you and the other delusional, sewer rat, Antonio Trillianes also failed to face justice. President Duterte by the way is not hiding from anybody, previously, they welcomed a fair, honest, unbiased and independent investigation, however the ICC are very politically motivated and bias. The Philippines could never be granted a fair trial at the ICC whilst you and your rogue colleagues go round the globe spreading lies and fake news about the President. I hope you hang your head in shame.